Howard Oliver Chambers was born in Nhill, Victoria in 1885, second son of Oliver Cromwell and Ellen Chambers. 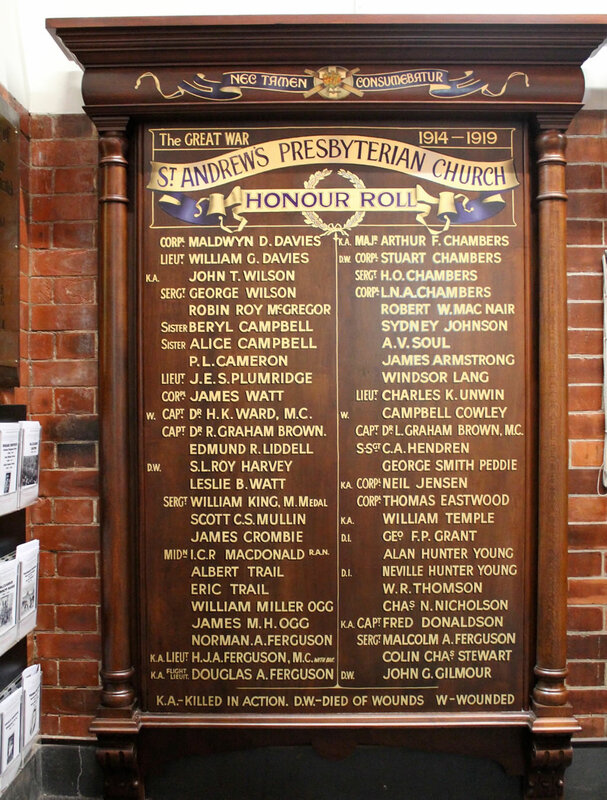 The names of four Chambers soldiers appear on one of the Honour Boards at Saint Andrew’s Uniting Church. They belonged to a large family of six brothers and four sisters. Their parents were Oliver Cromwell Chambers and Ellen (née Bosher). Mr and Mrs Chambers began their married life in 1877 at Nhill, Victoria where the older children were born. They later moved to North Queensland then Roma in Western Queensland. At the time when the four sons were enlisting for service in the Australian Imperial Force in the Great War, their parents were living on a farm called Balmah at Elbow Valley between Killarney and Warwick. It was Howard’s 30th birthday on the day they disembarked. The horses were transported by train overnight to a camp near Heliopolis. Howard made many observations about life in Cairo during the weeks that followed. “Ploughing is done by a couple of oxen in a plough that was made in Noah’s time,” he said. He noticed the crops, the buildings of stone, the encounters between the Australians and the New Zealanders. He wasn’t at the Battle of the Wazzir because his diary on Good Friday records his trip through Cairo and out to the Pyramids. He wrote about the cold nights, the men going to the hospital, sand storms and loose pebbles making walking and marching across the desert very difficult. Howard was in touch with his brother, Major Arthur Chambers who had landed in Cairo ahead of him. Arthur went across to Gallipoli, again ahead of Howard, but was evacuated to hospital just as Howard was arriving in reinforcements. In August 1915 the Australians were used to create diversionary ‘demonstrations’ during the debacle of the Suvla Bay operation. The 2nd Light Horse Regiment had 16 killed and 36 wounded in a suicidal attempt to capture the enemy position at Quinn’s. Howard and Arthur were part of the now famous evacuation from Gallipoli and their regiment sailed for Alexandria on 19 December, the brothers spending Christmas Day at sea. Back in Egypt the regiment regrouped in the Mounted Force which fought the Turkish army in the Sinai Desert, Palestine and Jordan. The desert terrain and environment were exhausting for both men and horses; water was at a premium and of poor quality. It became an essential element in the strategic planning. On one occasion Howard Chambers’ diary tells of a reconnaissance party infiltrating at night well behind the enemy lines to prospect for water. They took a heliograph and a basket of carrier pigeons with them in case they needed to communicate. The Regiment improved their trench lines and maintained patrols around the Shellal area and there were several diary entries about attention to his brother’s grave. Despite the personal trauma, he was still in the front line and involved in such dangerous stunts as the demolition of the old Turkish railway line running to Beersheba. He then returned to a training school near Cairo as a musketry instructor and from his diary it seemed as if the less stressful life behind the lines was helping to heal body and soul. However, tragedy struck again at the end of July 1917. In the previous December Arthur had received a family letter saying that two other brothers had sailed for France at the end of November. Howard’s daughter, Lyn Plumb pointed out that her father’s diary had only five inconsequential entries between August and the end of November after writing, “Received cable last night with the sad news about poor old Tooey.” The much loved youngest brother, Stuart had been killed at only 20. Howard received a promotion to the rank of 2nd Lieutenant on 21 September 1917. The New Year (1918) found him on secondment, in command of the training squadron near Cairo. Meanwhile the Regiment had been heavily involved in the action which secured Beersheba and Gaza in early November. Jerusalem fell in December and the Regiment spent Christmas near all these ancient cities known in Biblical times before continuing the attack into the Jordan Valley. In May he rejoined the Regiment near Bethlehem where he contracted malaria which was to trouble him for the rest of his life. So many of the force had to be evacuated with malaria that at one stage the regiment had only one man for every three horses. At last, despite a bout of malaria, he boarded the ship Kaldozian on 2 April 1919 from England bound for Australia. Amongst the 1400 on board he noted some well known people - CEW Bean (reporter), AB Patterson (Banjo), CG Macartney (cricketer). They arrived in Brisbane on 12 May 1919 and he was met by his parents and sisters and in the next few months travelled to Warwick, North Queensland and Sydney to visit his brothers. “What bitter-sweet reunions they must have been,” said Lyn Plumb, “in the knowledge that two brothers were not to return.” The marriage of Howard Chambers and Sarah Hunter Arbuthnot was held at St Paul’s Presbyterian Church, Mackay on 17 January 1923, Rev R Bardon officiating. Lieutenant Howard Chambers served again in the Garrison Battalion in New Guinea during World War II. In his later life he was well known in Mackay. His grandchildren and their families lived there too. Howard died in 1969, aged 84 years.